Tuesday night we held our third GC: Exchange meeting at MoJoe’s Bar & Grill on Broadway. The evening was very informative and (I hope) a lot of fun for everyone there. I’d like to thank our special guests for attending and sharing their work with us. First up were Baruch Sachs and Cynthia Langlykke from the West Broadway Neighborhood Association. Baruch and Cynthia told us the history of the WBNA, got us all up to speed on their current work, and discussed some of their plans and wishes for the future. You can download the handout they had here . Also be sure to visit the WBNA website for more info on the upcoming Armory Open, taking place May 11th at the Cranston Street Armory. We also had Stephanie Federico and Pleshette Mitchell from City Hall come to talk about the Mayor’s Graffiti Task Force. The Task Force is preparing to announce people who have won the $500 reward for information leading to an arrest. Through the spring the Task Force will be catching up on the graffiti that has been piling up over the winter. In the summer neighborhood watch programs will be implemented throughout the city. We look forward to seeing the city continue to attack the graffiti problem and seeing how the community can become more involved. We’ll be talking more with Stephanie and Pleshette in the coming months and will be posting more information here. In addition to thanking our guest speakers, I’d also like to thank MoJoe’s for hosting us, and of course thank everyone who came. We had some great questions for our guest speakers and some great discussion over good food (mmmm Doughboys…) and drink. 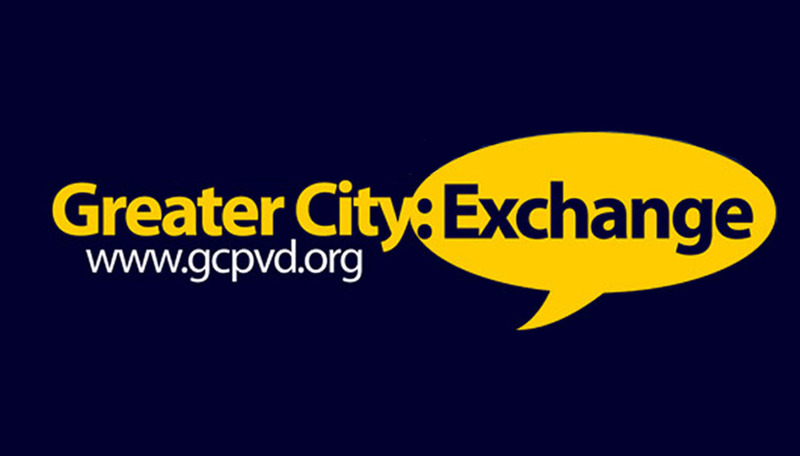 The next GC: Exchange will be on Tuesday, May 8th (as always the 2nd Tuesday of the month) where we will be discussing the Transit 2020 report. Check back here for the time and location of this and future meetings, or sign up for our newsletter to receive our latest news.